Posted under Health Guides. Updated 24 October 2017. Try to limit your total sodium intake to 2300 mg per day, or lower if you have high blood pressure. Choose more fresh foods and fewer processed foods. One of the ways to manage high blood pressure is by following a low-salt (also called low-sodium) diet. Sodium is a mineral that is required to maintain good health, though most of us eat far more than our bodies need. Almost all fresh foods have small amounts of naturally occurring sodium. In contrast, processed foods are typically much higher in sodium because, salt is often added during the processing and preparation of foods. In fact, processed foods typically make up to 75% of our sodium intake! Pizza, deli meats, soups, snack foods (chips, pretzels, and crackers), cheeses, sauces, and breads are some of the foods highest in sodium that teens typically eat. How much dietary sodium is recommended? The Institute of Medicine recommends limiting your total sodium intake to 2300 milligrams (mg) per day, with a stricter recommendation of 1500 mg for those with hypertension (high blood pressure). One major concern with eating too many foods high in sodium is that it can cause your body to hold onto water and increase your blood pressure. This makes your heart work harder and can harm your blood vessels, leading to hypertension (aka high blood pressure) and other heart problems such as stroke. If you are at risk for either of these conditions, it is recommended to limit sodium intake to 1500 mg per day. A typical teen has almost twice this much sodium, so it may be easier to follow a low sodium diet if you cut back gradually. Eating more fresh foods and fewer processed foods will help you eat less salt. Reading the Nutrition Facts Label on the foods you eat can also help you figure out which foods have less sodium. Look for the milligrams of sodium listed on the label. 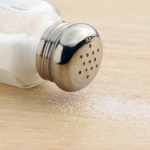 Compare the sodium content of different products to find the one that is the lowest. Also, look for foods that advertise that they are “low-sodium”, “reduced-sodium”, “no sodium”, or “no salt added”. A food that is labeled “low sodium” will have less than 140 mg per serving and a “no sodium” food will have less than 5 mg. If I don’t have high blood pressure do I need to be concerned with how much sodium I consume? While healthy teens do not need to strictly watch their sodium intake, decreasing the amount of sodium in your diet can help prevent high blood pressure in the future. Leave the salt shaker in the cabinet. Try not to add salt to your food, or at least cut down on the amount of extra salt you use. Use onions, garlic, herbs, and spices, or try fresh lemon or lime to flavor your food. Limit your condiments. Condiments such as mustard, ketchup, BBQ sauce, soy sauce, and teriyaki sauce are usually very high in sodium. Use very small amounts of these and choose low-salt or reduced-salt versions. Avoid cured and high-salt meats such as bacon, sausage, bologna, pepperoni and ham. Limit deli meats and cheeses. Try using fresh or frozen poultry like chicken or turkey, or choose low-salt versions of deli meats. Limit the amount of pre-packaged and processed foods you eat, such as frozen meals, macaroni and cheese, pizza rolls, and chicken nuggets. These types of foods tend to be high in sodium. Check out the Nutrition Facts Label and choose the options that are lowest in sodium. Stay away from pickled foods and those packaged in brine (salt water) such as olives and pickles. Choose fresh or frozen vegetables instead of canned. If you like canned vegetables, pick “low-salt” or “no-salt added” veggies. Draining and rinsing canned vegetables and beans can also cut sodium by up to 40%. Limit snack foods that are high in salt. Look for “reduced-salt” or “low-salt” chips, popcorn, pretzels, and crackers. Try unsalted nuts and peanuts. Instead of French fries, ask for a side salad or fruit. Stay away from canned soup. Canned soups are super high in sodium. Many soups and broths contain a whopping 600-950 mg of sodium per serving (or more!). Read the nutrition food label and look for “reduced sodium” or “low sodium” varieties, which usually contain half the amount of sodium (200-400mg per serving). Remember, if a can of soup contains two servings and you plan to eat the whole can, you need to multiply the sodium per serving by two. If I have high blood pressure, aside from following a low-salt diet, is there anything else I can do to manage my blood pressure? Eating an overall healthy diet that is low in salt and high in fruits, vegetables, low-fat dairy, whole grains, and lean proteins will help manage your blood pressure. Doing regular exercise is also an important part of managing your blood pressure. Stress can also increase your blood pressure so taking deep breaths or using other stress-reduction activities can be helpful. Can I still eat fast food? Once in a while, it’s okay to eat fast food, but remember it tends to be very high in salt, so try not to eat it too often. When ordering at fast food restaurants, choose salads or foods that are grilled, broiled, or steamed rather than fried, cured or smoked foods. Limit high-salt toppings such as ketchup, mustard, BBQ sauce, and pickles. Ask for your dish to be prepared without extra salt. You can also look up the nutrition facts on almost all fast food menu items online. Check out the menu ahead of time so you know which options have the lowest amount of salt. Following a low salt diet might take some getting used to. Your taste buds should adjust to the change quickly, though. After that, following a low salt diet probably won’t be that hard for you! It’s well worth the effort because the diet may help lower your blood pressure and your risk for heart disease.